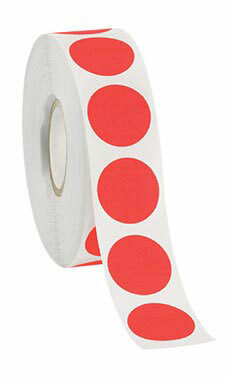 Fluorescent Red Self-Adhesive Labels are great for pricing small items, color coding and inventory control. All of our self adhesive labels feature a smooth 3/4" diameter matte finish and are sold on a roll of 1,000. The labels work well with any of our matching color fasteners and perforated coupon tags. An absolute must have item for use in consignment, thrift, and gift stores.